A University of Ghana Pharmacy student has been arrested by the police for raising a notice requiring the quick opening of the UG Medical Center. The student, identified as one Sekyi-Brown Reginald, is reported to have raised the notice amid a program where the First Lady Rebecca Akufo-Addo was in attendance. 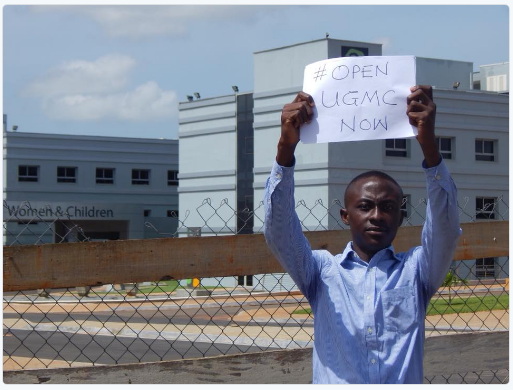 Reginald was spotted holding a notice with the engraving "Open UGMC Now" when the First Lady went by the Korle-Bu Teaching Hospital to cut sod for the construction of a Pediatric Intensive Care Unit. The apprehended student is perceived to be a solid backer who has been pushing for the opening of the University of Ghana Medical Center (UGMC). Reports suggest that he has been detained at the Korle-Bu Police station for raising a notice whiles the First Lady was present at the program. His reported arrested has raised worry among some Ghanaians on social media, with a segment bemoaning the activities of the Police. The UGMC was initiated in 2016 by the former John Mahama administration. The first face of the project was then commissioned in January 2017, making it ready for use. In any case, the office has since stayed sit following an impasse between the University and the Health Ministry over whom to oversee it. A year ago, the issue got warmed up to the degree that the UG Board walked out of a negotiation with the Health Minister. It stays to be seen, however, why the police would arrest a student for raising a notice to require the opening of the facility.